The past three days have been the celebration of Thai New Year, called Songkran. The tradition is to sprinkle water on someone which is to give them a blessing; although it has turned into a giant water soaking battle. For the first day I was going over to my friends house for a bbq, they live in the red light district so I knew it might be a little crazy. 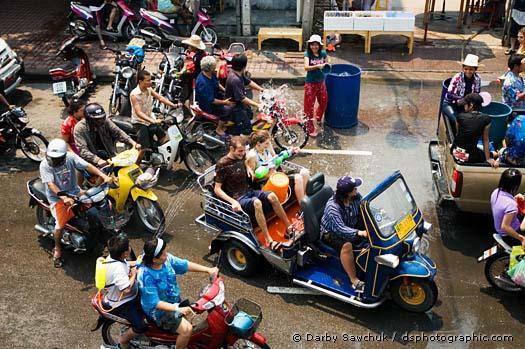 Never having experienced Songkran in the city before, I didn't know what to expect. I double ziplocked my phone and camera in my purse, as I had been previously warned. I ventured onto my street hoping the buses were still running. The bus was real empty...very unusual. A the next stop down, two little kids with big buckets of water tossed them right into the bus. I saw them coming so I ran to the back/other side of the bus. But the other foreigner appeared to not know what was going on and was completely soaked head to toe. I felt kinda bad.... I realized maybe the bus isn't that smart, you're basically sitting ducks to be hosed with water. It wouldn't be so bad, but they often use the nasty river water so when you get wet it smells and many many people get sick after Songkran because there's so much bacteria/disease in the water and it gets in your eyes. The next couple days I was more prepared so it wasn't as bad. My street really gets involved, they have a large inflatable pool filled with water that they draw from to have a never ending supply. One night I really needed some food, so I went across the street and literally had to run away from people with the buckets and plaster, screaming May Aw Kha!! May Aw Kha! !--meaning I don't want! I barely made it dry. Now I totally understand why some people hide away in their house until the festival is over. It's so crazy I can't believe the whole country takes part in it. 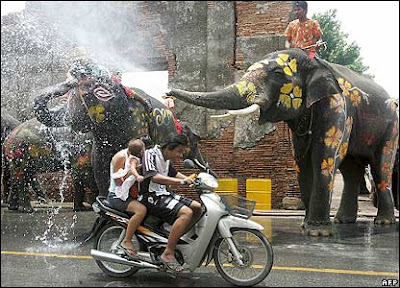 It really is a lot of fun, and the Thais are so genuinely happy and laughing and really enjoying themselves. It's definitely a uniting experience. What a fun festival! I think the U.S. should adopt it!